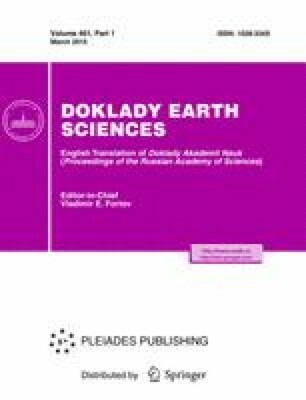 This study reports the first find of a jadeite-bearing eclogite spatially associated with UHP ultramafic rocks of unit 1 of the Maksyutov complex (near the village of Karayanovo). Two phases of elcogitization were recognized based on mineralogical data, petrographic observations, and isotope geochronology. The first UHP metamorphic stage (533 ± 4.6 Ma, P > 4.4 GPa, T > 700°C) was defined by the assemblage jadeite + grossular-almandine + rutile ± phengite. This assemblage was later transformed into omphacite + grossular-almandine + phengite + albite + clinozoisite + titanite at a retrograde phase of stage I (392–485 ± 2–4 Ma, P > 3.1–3.4 GPa, T > 633–740°C) with decreasing pressure and temperature. The second prograde phase (360 ± 3 Ma, P > 1.1–2.2 GPa, T > 450–550°C) of HP metamorphism was marked by the development of a chlorite rim (almandine-grossular—pyrope-almandine-grossular, diopside, clinozoisite) around the eclogite body. A comparison shows that the studied eclogite and ultramafic rocks followed a common P-T-t path. Jadiet-bearing eclogites and meta-ultramafic rocks represent UHPM fragments of the mantle and crust, which were tectonically emplaced in quartzite schists of unit 1. Original Russian Text © P.M. Valizer, A.A. Krasnobaev, A.I. Rusin, 2015, published in Doklady Akademii Nauk, 2015, Vol. 461, No. 3, pp. 316–321.